Do you work at Jak's? Jaks is a nice little place. Such a rip-off! They never let us know that we could add 2 sides to our main dish for free and they charged 1 lt of still water for 7 pounds! Their cheesecake was not that fresh and they include service charge although it's almost a self - service restaurant. Disgusting customer service at the Jack's bar next door, they ruined my evening with my girlfriends! Clearly didn't feel like I was at a fancy bar at the prime location! noisy and over-rated with not so great food, try our favourite hang out - Muriel's Kitchen in South Ken! excellent place.. real homemade food.. relaxing any time of the day.. lunches can get busy... valentine the owner brings a great joy making everyone feel special tiramisu and strawberry cheesecake is a must.. fresh juices.. organic... suits everyone even does take away..great prices.. for everyone..
Jak's is a real London treat - hidden away on the lovely Walton Street and within easy walking distance of the King's Road and Harrods. 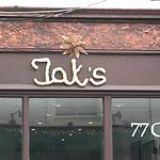 Jak's serves good quality, home cooked Mediterranean dishes, that have won the heart of many, so much so, that it now has a clientele of regulars popping in for breakfast, lunch, dinner or even just a piece of it's renowned strawberry cheese cake Vali and Alex (the owners) greet every customer with a smile and you leave, tummy full and vowing to return very, very soon. An unpretentious eatery serving healthy, affordable food in Knightsbridge? It’s not wholly impossible, as Jaks demonstrates. This café-style eatery sees a mixture of tourists and locals, with families stopping by during the day for lunch and groups of friends arriving in the evening. Ordering is done at the counter where the food is displayed, adding to the informal, jovial ambience. Jaks offers healthy yet highly appealing dishes, the emphasis being on Mediterranean fare that is prepared using locally sourced ingredients. Colourful dishes of moussaka, dolmades, chickpea and quinoa salads and tabbouleh pose behind the glass counter. The lemony marinated artichokes with sweet roasted red peppers, the baked aubergines stuffed with tomato and the hearty chicken pie with mushrooms and melted cheese are all worth a try. Salads are herby and flavoursome, an intriguing raw cabbage salad is garnished with zesty apple and parsley and the barley salad is surprisingly filling. It’s not all diet-conscious however, as the indulgent desserts include cappuccino cake, tiramisu and banana cake. A large slice of rich strawberry cheesecake is generous enough for two, and best of all, desserts are made freshly on the premises. Since opening three years ago, word has spread around the neighbourhood of this place's tasty roasted coffee, but if you want something stronger, a selection of wines and beers are also available. You can also tuck into suitably healthy fresh juices the staff will happily whip one up upon request. 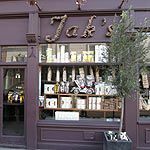 Furthermore, Jaks has opened its very own late-opening bar just a few doors down at number 87. Expect to pay around £15-£20 a head for a substantial meal, making Jaks ideal for those looking for a thrifty bite to eat in this upmarket area.